Since its opening three years ago, Oasis Skateboard Factory (OSF), founded by teacher Craig Morrison, has attracted considerable media exposure and received a Ken Spencer Award from the Canadian Education Association (CEA) for its innovative program. OSF is one of three programs offered by Oasis Alternative Secondary School, one of 22 alternative secondary schools of the Toronto District School Board (TDSB). Students design, build and market skateboards, along with paraphernalia for the skateboard culture, and earn academic credit. Students may enrol for as many as three semesters. What gave you the idea to start the Oasis Skateboard Factory? When I was curriculum leader at Oasis Alternative Secondary School, I was the onsite principal’s representative. So I had a great experience at how to run a whole school. At the same time, I was also the arts teacher and I ran a street-art program. I started a skateboard design class with the help of Roarockit Skateboard Company and its co-owner, Ted Hunter, who had adapted a method of pressing skateboards. He’s a professor at the Ontario College of Art and Design (OCAD). Prior to that, the whole skateboard industry was constantly telling kids: you can’t make your own skateboards or that a real skateboard had to be bought from a company in California. And the irony of that is all the wood is Canadian – hard- rock maple – which gets shipped to China, then sent to a skateboard company in California, to put their logo on it and ship it back to us. People had been doing skateboard building in shop classes. I was interested in this as a vehicle for graphics originally, the really funky street-art graphics that we were doing, until I realized that it could be a vehicle for so much more. Early on in that program, I started a blog. I’d take a picture of a kid who’d finished a board, just simply that. If there’s anything that has made this explode, it’s people’s responses to a picture of a kid holding that skateboard. The look on their faces … that really helped me convince people why they should support this. So we have a kid who never comes to school, never gets credits, and all of a sudden they’re engaged in their education. I had good attendance in that class and good achievement. I ran the skateboard art class for three years. The kids were selling their boards. I thought if I had a whole school, I could teach the whole curriculum through this, through the experience of running it as an entrepreneurial business. So three years ago I pitched to my school and then to the principal the idea that I would step down from my position to do a satellite program, because my skateboard class was super-successful. I have to say, that was a huge leap of faith, although I did have resources. I had a gallery I had done shows with before; my skateboard class did an art show in a coffee shop; and I had the Roarockit Skateboard Company and all the people I knew in the arts community. It also arose from my frustration of wanting things to happen. You see these students, who are superstars, just no one has given them the spotlight or the focus, or no one has put the wedge in the door before it slams shut. I wanted to do this thing with these kids. Right now we have a 100 per cent success rate; for the previous two years, I had like 97 percent last year, it was in the 90s in the first year of the program. That’s a huge success rate for any kind of alternative school, let alone school. What happens at the Oasis Skateboard Factory? Students go to school 10:30am to 3:30pm. It’s a workshop for five hours a day in order to get the four credits…So we’re probably one of the latest-starting schools. You know, many kids are always late in the morning. Let’s get them in and engage them and then keep them the whole day. So I don’t really do breaks and they’re with me all day. And it means they’re really productive, like kids don’t go out and smoke pot and come back late. I have hardly any classroom management issues. We have breakfast and lunch here. We eat together. We don’t have a lunch hour but we eat while we’ll have a business meeting. Or if it’s a workshop day like today, they’ll just eat at their own pace when they need to. They know their projects. They get assessed and given feedback every day; being on task, being on time, being respectful (laughs), being a good advocate for our program – the leadership part of this, the outreach part. It’s a semester school; students receive four credits per semester. I’ve got students here now who have been here for three semesters – it’s usually a semester then students do a leadership program with me and our community partners. I went to teachers college at Queen’s University in the artists-in-community-education program. I’d done a lot of activism with youth and I’m an artist and designer. So I did the community-artists-in- education program in which you got to design your own practicums. I made sure I did one of them at an alternative school in Toronto. There I started an arts and social change program, and this is back in the old days in alternative schools where they were called catalyst teachers and it was just people in the community who were experts in their field, so me being really tapped into street art, I’d teach a bunch of classes to kids who were interested. My first job was at Lakeshore Collegiate in Etobicoke. Then I took my daughter to Alpha (opened in 1972, the first alternative elementary school in the TDSB), one of the freest alternative schools and I walked upstairs to Oasis and I said, hey, I’m a teacher and I love alternative schools. I started the next day! How do OSF students earn credits? I’m probably running 20 different courses. And that’s just something alternative schools teachers do. You have classes that are Grade 9, 10, 11 and it’s up to me to differentiate that. We have four groupings of courses: English and leadership; business and entrepreneurship; art; design. I do an English grouping: English Grade 10 and 11, English Media then leadership. A lot of what we do is writing, for promotion, non-fiction, a focus on business writing. They’re writing about their products – how do you write technical specs, advertising, that kind of stuff. We do a skateboard “zine” [a small-circulation self-published magazine], which is a hugely popular form of alternative media, so they can promote what they’re interested in. 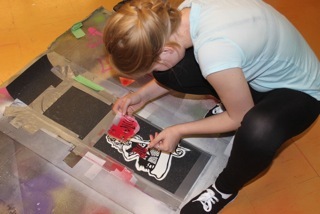 Our theme is always around street art or skateboard culture. We do interviews with bands and skateboard makers in our local community. We distribute the zines and sell them at art shows. Every semester we write for Concrete Wave Magazine, which is the professional skateboard magazine. This year we get four glossy pages. You know, it’s funny how kids who don’t want to write or would never check their spelling or grammar do awesome work when they know it’s going to be read…The last one we did was really interesting: the emotions of skateboarding, the stoke you feel when you’re skateboarding. The next step is a leadership course and we do a lot of outreach in that. Our students become teachers. Last semester we did a workshop series at an elementary school, a workshop series at a Montessori school and another through a youth arts program at the Art Gallery of Ontario (AGO). Business credits include a grouping of courses like Business 9 and 10, Grade 11 Entrepreneurship and Grade 11 Marketing. That grouping of courses we run in partnership with The Baitshop in Parkdale. We’re taking kids through the experience of building their own company, branding that company and making the products that surround those skateboards: buttons, skateboard stickers, and other merchandise…We make really professional t-shirts, which we sell. Then it’s double art. It’s visual art, street-art class. We’re doing street art, legally, of course. We deal with people’s businesses for space. It makes kids realize the legalities and how to negotiate, because some of these kids do this on their own outside of school whether adults like it or not. It’s helping them to see they can actually connect to something bigger – a mural, for example. And the last course is the skateboard design class. People a lot of times think of the school as a skateboard school. Actually it’s a skateboard design program. It’s a design school. Usually schools don’t encourage kids to take more than one credit in art in high school. Here I connect art to the central skills that are the most valuable skills, and make connections to transferable entrepreneurship and business skills. We don’t do exams. But students are evaluated. I’m seeing curriculum through the lens of skateboard culture. There’s boring stuff, like in the business textbooks. Characteristics of an entrepreneur – you know how boring that is to read to a kid? But you show them Big Daddy Roth, grandfather of custom cars. Let’s look at how he embodies that. What can we learn about that with our skateboards? All of a sudden it’s wild and exciting. Or we’re talking about design. Why are we looking at famous artists? What about the graffiti right on the corner? You build from their experience. I completely cover the curriculum. These kids do more than the curriculum, because they’re connecting the curriculum to the world in a real physical way. We’re out in the community. We’re doing projects. This semester they’ve taught workshops to OCAD students. It’s this great inversion. There’s this person who’s a designer and artist, who’s an authority on teaching others. He said our kids are better behaved, better engaged than kids from university. They’re superstars. It’s amazing. How are OSF students benefiting beyond the credits they’re earning? We like to work independently. At the same time, we’re part of a team. When we get into jams and deadlines, we’re working together. There is no acceptable late here, because late doesn’t cut it in the world. Like that board over there has to be finished on Friday to go to a client. There’s no pre-existing economy for student-made skateboards. So these kids are creating that economy. We’re not just about making a profit. It’s about working with good people we want to work with. They share our values. Then there’s the embedded learning, how we look at a board as being about a lot of things. It’s not just a design project or a business project. It’s everything all together. It’s project-based learning. The projects go out into the world. That board when it’s done will have been shown in an art show. It will probably have been bought by someone in a shop. It will have been written about. The kid will have learned to market their business. We’ve got boards right now in Longboard Living in Kensington Market, which are sold alongside professional skateboard brands, and people buy our stuff. So we’re not making toys, we’re making professional-level stuff using technology and methods developed by Roarockit Skateboard Company. We don’t do just passing-level work. I have high expectations of them, and they thrive on that. They see the real stuff they’re capable of. So when they experience that, it’s powerful. So it’s high expectations, which is hard for some kids. But we offer support for them. This is something alternative schools are really good at, because we’re not authoritarian; we know as much as possible the individual needs of our students. Why does OSF work for kids who had been disengaged from school? Because of the engagement with art. You show me a better engagement tool; I don’t think it exists. Every project we do here is art or design in a way, even in business class or English class. Everything we do gets shown in public. I have a really strong negative feeling about projects that a teacher marks and puts in a file folder and that’s the end of it. We’re a re-engagement program and we are reconnecting kids with something that got them in trouble: graffiti and skateboards, things that adults don’t like. Half the books in the art section of a bookstore are on graffiti and street art now. Graffiti is not a marginal activity. Young folks who work in advertising agencies have backgrounds in street art, appreciation of graffiti. You see it all around us. So I hook kids with the things that get them in trouble to a productive outlet. And we reconnect them to adults. So they have adult mentors in the community, and their parents actually start to reconnect with them because these kids do art shows – we show everything. The parents show up to the art shows, our events, our sales, our pop-up shop [classroom]. All of a sudden they’re proud of their kids. That’s a nice feeling to feel proud of your teenager. What is the selection process for new students? We do hour-long info sessions, which is my advertising for this program. At the end of that I give them an information package. I ask them to design a skateboard – just a rough thing. I’m not looking for art skills; I’m looking for something I can use to engage them in conversation. Then we invite them in for a group interview. We run them through an experience with our students. I get to see how they work as a team. I take kids who I think will benefit from this experience. Here a kid doesn’t need to be good at art, but they have to want to do it. It’s for that kid who’s into skateboarding but also likes art or likes computer or visual culture or graphics. What happens to students when they leave OSF? Students are here for a semester. Then, if they have success, which they all do, they can move on to the leadership program. And the kids want to do that because they do all this stuff that’s really cool. And some kids have been here for three semesters because they just don’t want to leave. For some girls who are in that situation this year, we wrote a grant. They work with middle school girls. The girls got materials to start their own companies. So when they’re done with this, they can just do it themselves. I often counsel students to go to another kind of alternative school because they still get that arm around the shoulder, someone is there for them. Some kids want to go back to a regular school because of the program, like a shop or music program. They come in needing so many credits to graduate. I help them get over the hump. I had a girl who wouldn’t talk to anyone when she started, wouldn’t pick up a pen. Last year she was valedictorian at her school and graduated. How does your location benefit the program? The Toronto District School Board has always had a classroom here [in the Scadding Court Community Centre]. Oasis Skateboard Factory is one of three components of Oasis Alternative Secondary School. The other two are The Triangle Program [LGBTQ] and The Arts and Social Change Program. I saw the opportunity here because we have a skate park right here – an infamous skate spot. You have all these other official skate spots built of concrete. This is a real infamous skate spot right here. Kids built their own ramps. It’s a real great location. For an entrepreneurial business like ours, what better spot to be than across from Kensington Market? New Canadians are opening businesses, young people are opening things like vintage clothing stores and screen printing studios, and you have young fashion designers. The arts district has spread up here. We have a gallery show coming up near here. So it’s really an amazing, rich-in-resources area in terms of visual culture. Then we have the more corporate kind of art, which is the advertising and marketing all down King Street with all the design firms. So we’re in a perfect location to capitalize on the resources the community brings to us. We work with community partners all the time. How is the community involved in the OSF program? Ted’s [Ted Hunter, Roarockit] really my partner that started this. We have many partners, but he’s really the core of what we do. He teaches at OCAD and these kids get to work with him on advanced projects like this one right here (shows a student’s skateboard). It looks like a boom-box, sort of a radio thing with a handle. Ted helped that kid figure that out. No one’s ever done something like that in the world of skateboards. That’s why we get a lot of attention from the skateboard community. Here are these high school kids doing stuff that no one’s thought of. It’s amazing. And we’re bending wood like that drop-deck (shows another board). That’s a saleable shape in longboards right now. We’re figuring out how to bend wood like that. We’re getting expert mentorship. A lot of resources are in-kind, like working with people who believe in our mission. Our mission this year is to be doing professional work. We want no one to ever say, ‘oh that’s a student product.’ Some of our designs this year would sell on the spot. Skateboard shirts. Kids wear those things. If you go on our website and look at the clients we have and have built boards for, we do almost every independent coffee company. Most are owned by young people who probably skateboarded when they were in high school or have that value about supporting their local community. They support us. So I put these kids in relationship with other young people who are next up the path: graduated high school, maybe from an alternative high school, and are now young business persons. When kids sell a board it’s really about a relationship they’re building with the client. Could OFS be a prototype for other alternative schools? People talk to me all the time: how do you expand on this? Don’t just expand this. Take the model we’re doing here and just apply it to something else, because it doesn’t have to be skateboards. Take that auto shop that no one is doing something with, and instead of just repairing motors all the time, start painting those cars with pinstripes and flames and stuff, like “Pimp My Ride.” Engage them in visual culture, which they’re experts in and consumers of; they just don’t experience being makers of it. I’m trying to turn that around, making stuff with your own hands, making your own culture. Oasis Skateboard Factory, a program of the Oasis Alternative Secondary School and the Toronto District School Board, opened in 2009 at Scadding Court Community Centre in Toronto. 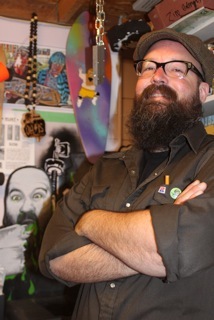 Craig Morrison is the creator and teacher of OSF. EN BREF – Fondée il y a trois ans par l’enseignant Craig Morrison, la Oasis Skateboard Factory (OSF) (l’usine de planches à roulettes Oasis) a fait l’objet de nombreux reportages et son programme innovateur lui a valu le prix Ken Spencer de l’ACE. L’OSF compte parmi les trois programmes de l’école Oasis Alternative Secondary School, l’une des 22 écoles secondaires alternatives du Toronto District Board of Education. Les élèves, qui peuvent s’inscrire à l’OSF pendant trois sessions, dessinent, fabriquent et commercialisent des planches à roulettes et des accessoires connexes, obtenant ainsi des crédits scolaires. Grâce à l’expérience OSF, des élèves autrefois désengagés ont raccroché aux études. Presque tous les élèves de l’OSF obtiennent leur diplôme d’études secondaires. George Pearson is a freelance writer and editor. His website, UpWORDlyMobile.com, is an accessible, non-preachy source of grammar and plain-language writing tips.